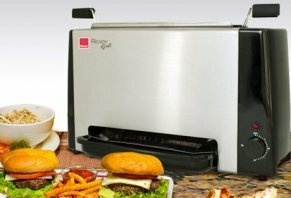 Ronco Ready Grill Reviews - Is it a Scam or Legit? The Ronco Ready Grill is a vertical indoor electric grill that claims to use infrared technology to help you grill an entire healthy, home-cooked meal for up to 5 people in 20 minutes or less, including meats, veggies, fruits and desserts, and even frozen foods. And by allowing you to grill inside with the speed and convenience of a microwave, but without all the smoke and mess, the Ronco Ready Grill is claimed to help you cook restaurant quality meals, with sides, in less time than it takes to have a pizza delivered. How Does the Ronco Ready Grill Claim to Work? Brought to you by the makers of the infamous “set it and forget it” rotisserie oven, the new Ronco Ready Grill claims to feature fusion direct heat that cooks food from the outside in, as well as dual concave infrared reflectors that simultaneously cooks your food from the inside out, giving you perfectly grilled meats and vegetables, without the hassle of traditional grilling methods. In addition, the Ronco Ready Grill is claimed to provide all of this while preserving your food’s flavor and nutrition, and using 80% less energy than traditional ovens. Because the Ronco Ready Grill is claimed to provide a “perfect infrared envelope” around your food, it will cook evenly throughout, regardless of what you’re cooking—even frozen foods (we’ll talk more about this in the final section). And while you food is cooking, the company claims that all the oil and grease will fall down into the patented, no-flare rapid cool pan for healthier eating, and the optional steamer basket can cook veggies and even rice at the same time. Pop your food in the metal basket. Drop the basket into the Ronco Ready Grill. Set the dial to the desired time. When the timer dings your dinner is done. After you’re done cooking, the Ronco Ready Grill is claimed to make cleanup as easy as popping the parts into the dishwasher. The Ronco Ready Grill is available in red or black, and is priced at 4 payments of $29.75 plus $19.99 S&H, bringing your total to $138.99. Alternately, you can make one payment of $119 that includes free shipping. You can also call the company directly to order your Ronco Ready Grill through a 14-day trial for $14.95, after which you’ll be billed in installments for the full price of the device. All Ronco Ready Grills come with a 1-year warranty against defects in material and workmanship, although you’ll have to register your product within 30 days from the purchase date in order to qualify. The Ronco Ready Grill also comes with a 60-day refund policy, less S&H charges. In order to process a warranty claim or refund, you’ll need to contact customer service at (800) 486-1806 to obtain an RMA number. Note: The Ronco Ready Grill is also available through the Home Shopping Network, Kohl’s, and several other third-party retailers, sometimes for less money. Can the Ronco Ready Grill Help You Grill Indoors in Less Time? What Do Other Consumers Have to Say? Based on consumer reviews found at HSN.com, the Ronco Ready Grill appears to have a middle-of-the-road reputation. While some customers found their food was cooked to satisfaction and that cleanup was fast and easy, some of the most common complaints cited longer cooking times than advertised (and many times, longer than it would have taken using traditional methods), lack of grill marks on food, uneven cooking (e.g. outside was burned and inside remained uncooked), and that there isn’t enough room to cook food for more than one or two people at a time. In addition, although the product’s website claims that “Actual cook times will vary based on thickness, size, amount, and temperature of food,” WMA Action News put the Ronco Ready Grill to the test back in August 2014, where their first trial involved cooking a steak, peppers, and onions. After the timer went off, the testers found that the grill took twice as long as advertised (18 minutes) to cook a steak, which still didn’t achieve medium rare consistency, and the onions weren’t completely cooked. Then, the team attempted to cook frozen chicken breasts and asparagus in the Ronco Ready Grill, and found that the chicken was far from being done, while at the same time, the asparagus was overcooked. Also, keep in mind that according to the grill’s instructions, heating up takes about 3 minutes, and is not “instant” as the product’s website might lead you to believe. In addition to the above concerns, while Ronco Holdings, Inc. based out of Austin, TX holds an A+ rating with the Better Business Bureau rating, the company has nearly 80 closed complaints (as of 11/4/14), the majority of which appear to reference difficulty exchanging products covered under warranty. While the Ronco Ready Grill may not be perfect and may involve some experimentation in order to cook food to your liking, based on numerous customer reviews, it likely won’t provide the texture or flavor of traditionally grilled foods. As long as you keep this in mind, many customers appear to have been pleased with their purchase. However, in order to save S&H charges and a potentially difficult return experience, you may want to purchase your Ronco Ready Grill directly through a local retailer. I ordered this grill a couple of years ago, and I LOVE it. It is perfect for steaks, hamburgers, chicken breasts and vegetables. I purchased the wide basket and skewers for vegetables. Wonderful! For steaks especially, I use a digital thermometer inside the steak while it is cooking at my steak comes out perfect, every time. What I also love is that I have no spatters to clean up, no mess in the oven! All the removable parts of this grill are dishwasher safe and clean up extremely well. This is one kitchen item that I am extremely glad that I purchased. And, I would purchase it again! I purchased one of these for five bucks at a yard sale. It was never used. I cooked chicken breast for 35 minutes and it was amazing. Tonight I made salmon, and it was delicious (20 minutes). I've been on a weight loss journey and I have lost 75 lbs since April, and this will be perfect and healthy cooking for the rest of my journey. The instructions don't tell you but it comes shipped with the heat shields jammed down too far. You will need a tool to dig them out. Then they can be re-installed so that their tops stay above the outer housing and it all works. I recently returned my Ronco Grill because of several problems. The cooking time is not even close. I tried multiple type of foods, each one took 2 to 3 times the average. The grease run off tray, was next to impossible to empty without making a major mess, no matter how much was in it. I've tried other Ronco products in the past, this is the worst. Ronco Ready Grill ROCKS and makes my LIFE EASIER! You are not going to believe how EASY this thing is to use AND how incredible the results are. Seriously. I cook lunch and dinner on it almost daily and even desserts. I love eating healthy, saving money and showing it off to my friends. I'm a ready Grill-a-holic! I'm watching TV as my meal practically cooks itself. I add a couple of minutes onto the recommended cook time and now it's time for some of best damn grilled food I've ever had with grill marks and without any flames or smoke. You'll LOVE this thing. Try it, love it, or return it because you can't lose. But if you grab one for yourself, you should go ahead and grab one for your friends in advance because my friends JUMPED to buy one after they saw mine in action. Happy New Year. Gee, this doesn't sound like the Ronco people posting a good review. It's written like a commercial. I bought this grill after seeing it on TV. I like that it does not smoke like other counter grills I had purchased. I moved into an apartment where you are not allowed to have BBQ's on the patio, not even electric ones, so I've been using a counter grill. They smoke and set off the smoke detectors here. The Ronco Grill doesn't smoke and cooks everything perfect. When I plated the food and cut into it, the steam came out and it was piping hot. I miss my BBQ but will use the Ronco above any other inside grill. I thought the blue was a protective coating so I tried to scrape it off. I hope I didn't ruin my grill. I like it but it's a lot to clean after each use. This was bought in a whim, but ever since we've gotten it, it's been used almost every day! Preheating aside, everything else is dead on. Worth every penny! Write a Review for Ronco Ready Grill!